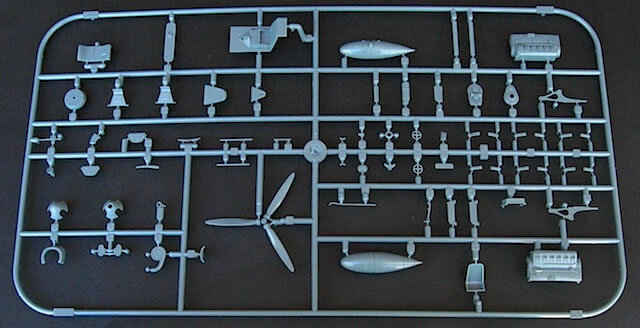 Approximately 152 grey plastic parts (28 unused); 6 clear plastic parts (2 unused); 1 decal sheet containing markings for 1 aircraft; 12 page A4 black and white instruction booklet. 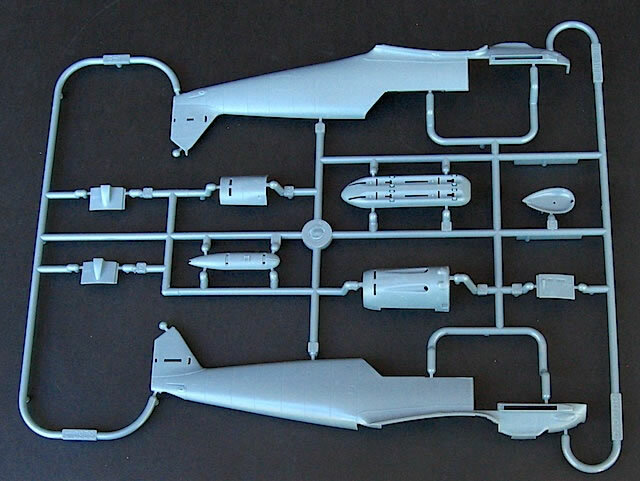 Eduard’s 1/48 Emil kits are well suited to the Weekend Edition format, being detailed enough to look good without the need for additional photo-etched parts. The early Jumo-powered Messerschmitt Bf 109s were groundbreaking machines, and arguably better than any equivalent aircraft in European military service at the time. This superiority was demonstrated in battle over Spain from late 1936, and more peacefully in July 1937 at a flight meeting in Dubendorf, Switzerland when three Jumo-powered Bf 109s outflew all foreign competitors. But as impressive as this result was, the Jumoschmitts were themselves outperformed by the two Daimler-Benz-engined Bf 109s that had accompanied them to Dubendorf. Admittedly the V-13 and V-14 were experimental, state-of-the-art racing machines, but they also pointed to the future of Bf 109 development. The first Daimler-Benz DB 601A-powered Bf 109, the E-1, began production in early 1939, followed shortly thereafter by the Bf 109 E-3. Manufactured in parallel, both types were identical except in armament: the E-1 carried four MG17 machine guns, while the E-3 was fitted with two fuselage MG 17s and two wing-mounted MG-FF cannon. Ultimately nearly 1,200 E-1s were completed, and served the Luftwaffe prominently in all early war campaigns. It’s hard to believe that it is four years since Eduard launched its 1/32 Bf 109 E family, and one year since it did the same in 1/48 scale. Eduard’s initial release in each scale was the E-1, a version that until then had been largely overlooked by kit manufacturers. 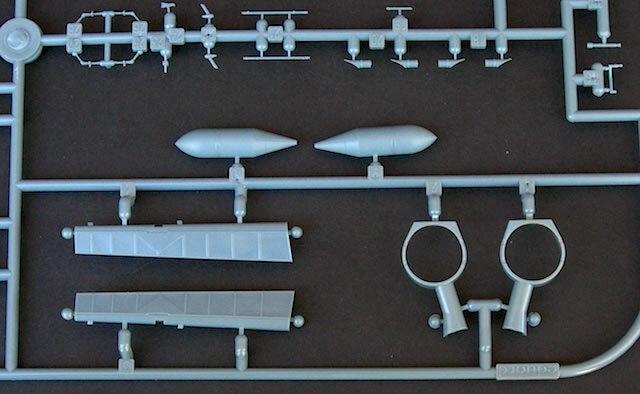 Brett Green reviewed the 1/48 Bf 109 E-1 Profipack boxing here in February 2012, and his opinion was that it was the best Bf 109 E kit in 1/48 scale. In this context, it is fitting that Eduard’s first Weekend Edition boxing of its 1/48 Emil series should also be an E-1. 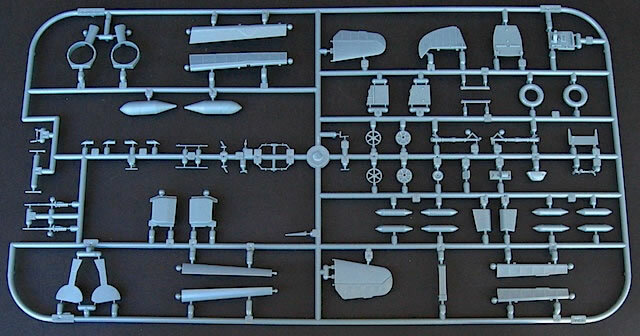 Examining an Eduard 1/48 Bf 109 E kit in Weekend Edition guise reinforces how compact and simple – in terms of kit parts count – the Bf 109 airframe was. 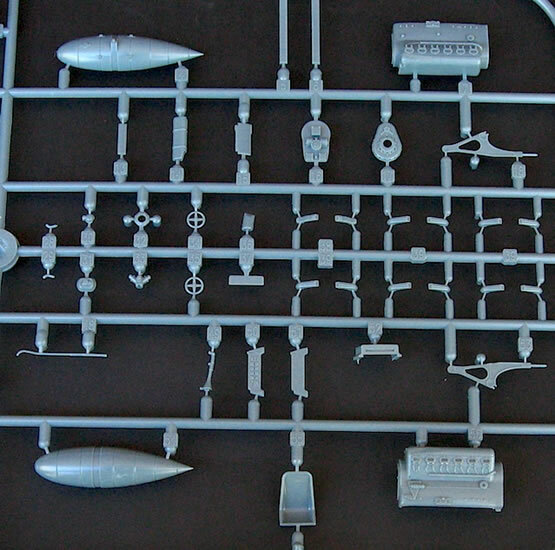 Without the photo-etched parts, canopy masks and glossy instruction booklet of a Profipack boxing, the kit sprues only half fill Eduard’s standard 15 x 9 inch cardboard box. Fortunately, the quality of the base kit means that an excellent model can still be built without any of the Profipack extras. Eduard seems to be moving away from the olive-brown plastic that characterized its kits for many years. 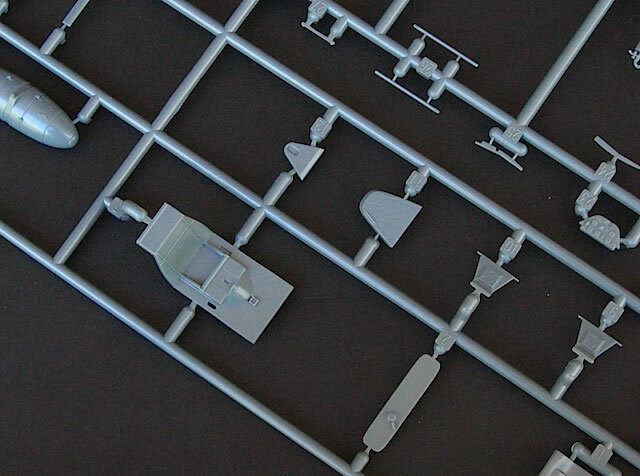 While the Bf 109 E-3 Profipack kit that I reviewed last month contained a mixture of olive-brown and grey sprues, this kit is moulded in grey only, in a tone slightly darker than the plastic used by Tamiya. 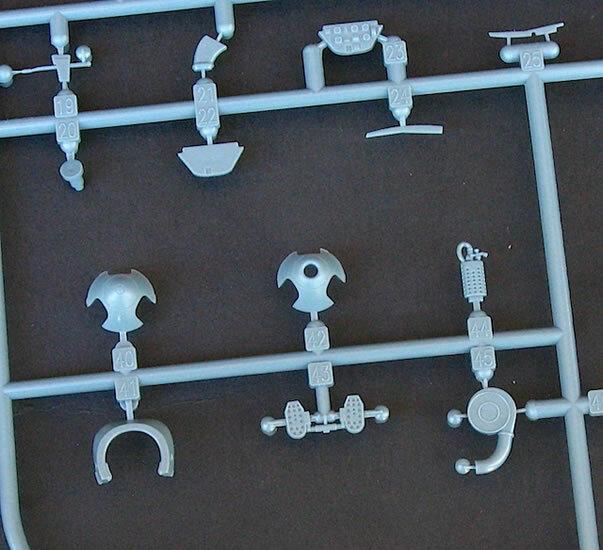 More important than colour is quality, and these parts appear excellent in all respects: a close examination found no blemishes or moulding flaws. 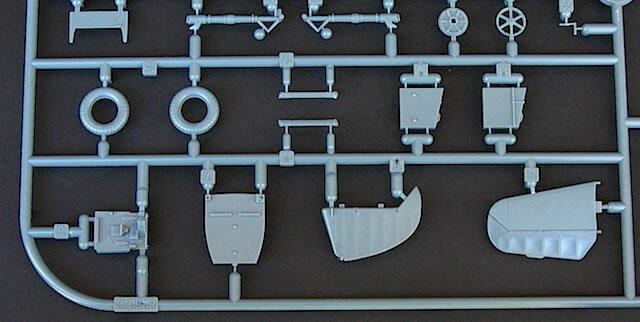 The sprue attachment points are amongst the finest I have seen, and can be easily nipped away with side cutters without fear of damaging the parts. Overall detail levels are very good. The representation of fabric on the control surfaces is outstanding, and includes finely rendered stitching on the ribs. 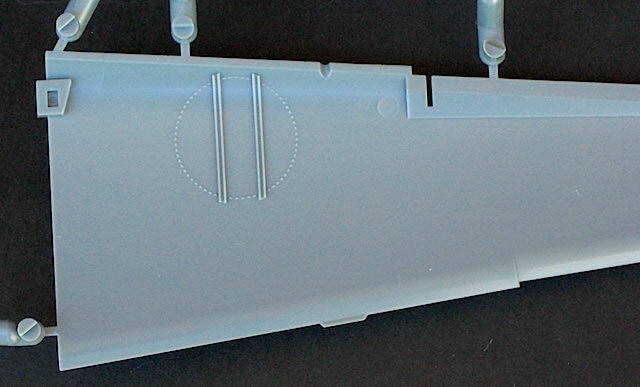 The engraved rivet detail on the main airframe parts may not be to everyone’s taste, but it is subtly done and will, I suspect, be close to imperceptible after painting. I also like Eduard’s depiction of the smooth E-1 lower wing, which lacked the cannon bulges of later Emil variants. 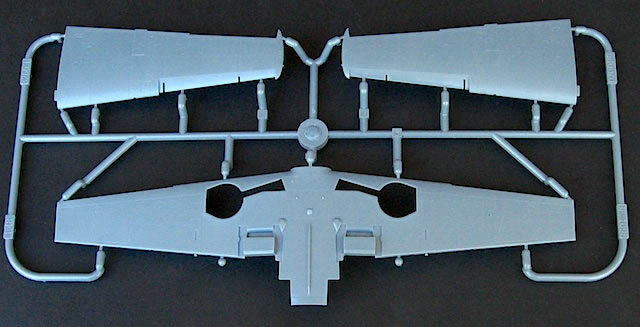 I still have vivid memories of hacking up the wings of a 1/48 Tamiya Bf 109 E-3 kit that I was attempting to convert to a cannon-less V-14 several years ago; I wish Eduard’s E-1 had been available then! 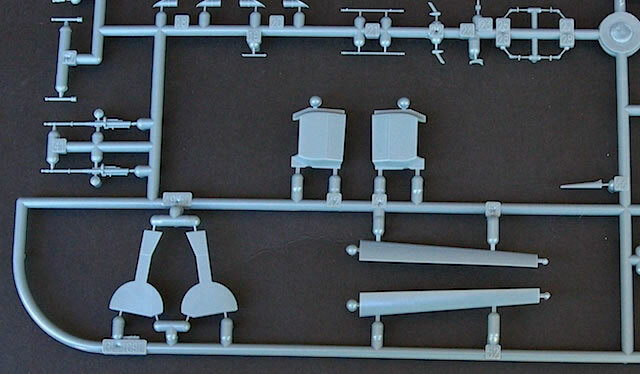 Eduard’s policy of tooling specific parts for specific versions, rather than a single generic part and a variety of inserts, continues to make life easier for modelers. 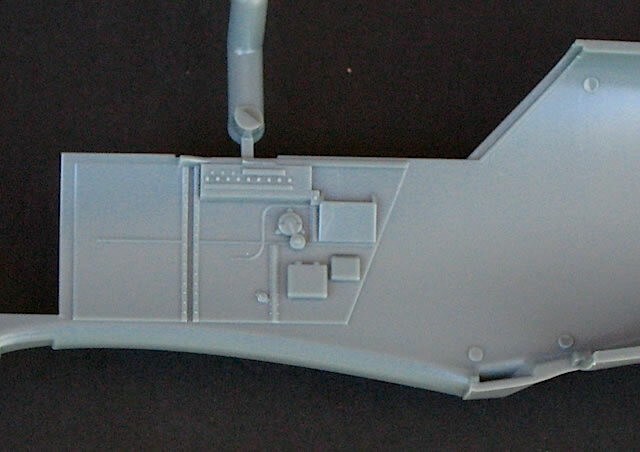 The cockpit is busy even without photo-etched detail parts, and with careful painting should look great. However, I would probably add some instrument panel dials and seat belts, particularly if I were finishing the model with an open canopy. 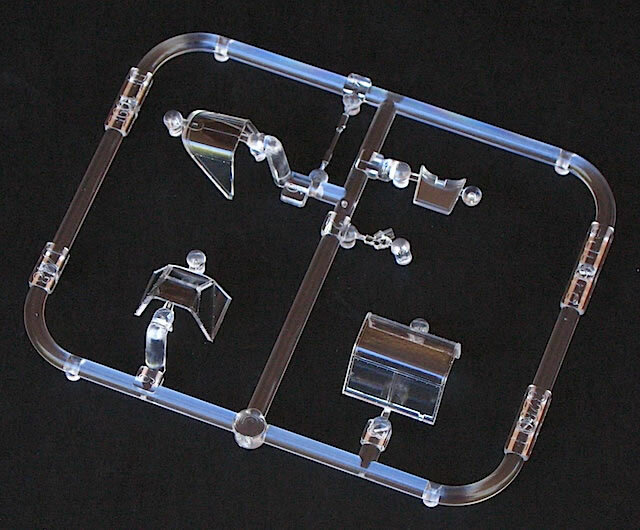 A dry assembly of the major components suggests overall fit will be good. 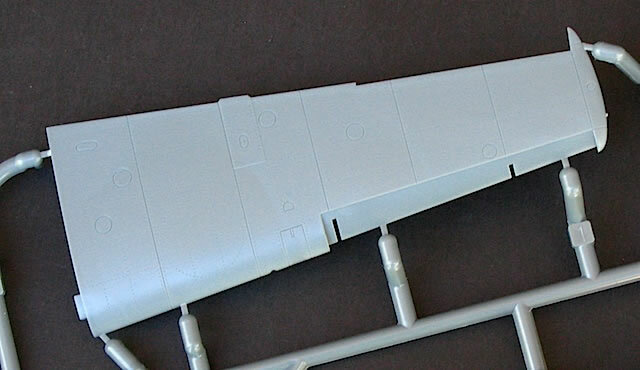 The absence of locating pins on the upper and lower wing surfaces, and their near absence on the fuselage halves, is slightly disconcerting in such a modern kit; however, it should pose no problems if you take your time with assembly. 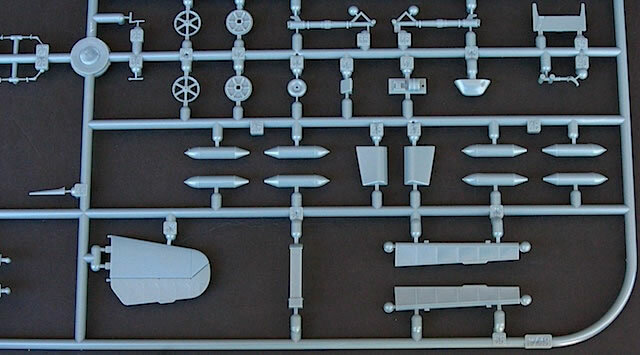 As with all Eduard kits, engineering is tight and you should follow the instructions closely. I would also recommend reading some of the available build articles on this kit (including here on Hyperscale) to familiarise yourself with the construction process. 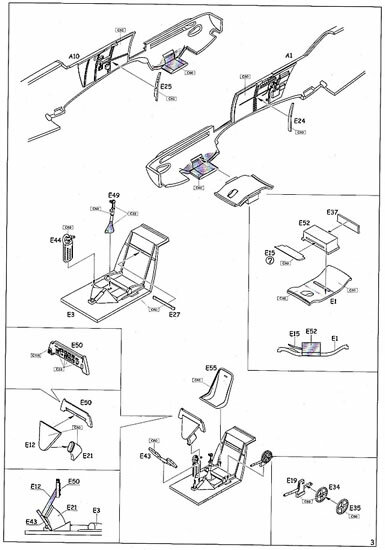 Speaking of instructions, the usual black-and-white Weekend Edition booklet is provided with the kit. 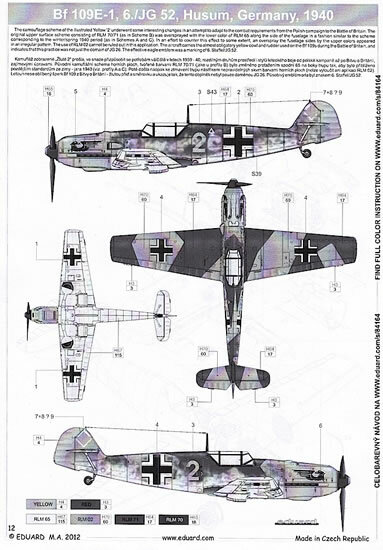 This doesn’t matter in terms of assembly – Eduard’s drawings are as clear as ever – but on this occasion I feel the black-and-white painting and marking guide is slightly inadequate, given the complexity of the paint scheme on the single marking option. Fortunately, a colour version is available on Eduard’s website (http://www.eduard.com/store/out/media/84164.pdf). 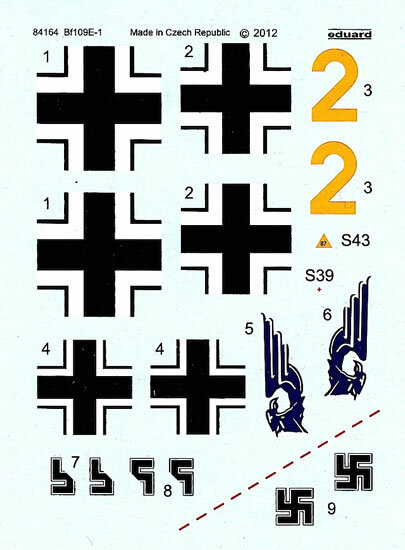 Markings are provided for Bf 109 E-1 ‘Yellow 2’ of 6./JG 52, located at Husum, Germany, 1940. This is one of the options provided in the original E-1 Profipack release, which identified the aircraft as being based at Calais, France in September 1940. ‘Yellow 2’’s paint scheme is certainly classic late Battle of Britain: RLM 02 Grey and RLM 71 Dark Green splinter over RLM 65 Light Blue undersurfaces and fuselage sides (the latter heavily oversprayed with an 02/71 mottle), with RLM 04 Yellow engine cowlings and rudder. I have found photographs of ‘Yellow 2’ that were taken after it had suffered a minor landing accident, and Eduard’s painting and marking suggestions appear to be accurate. 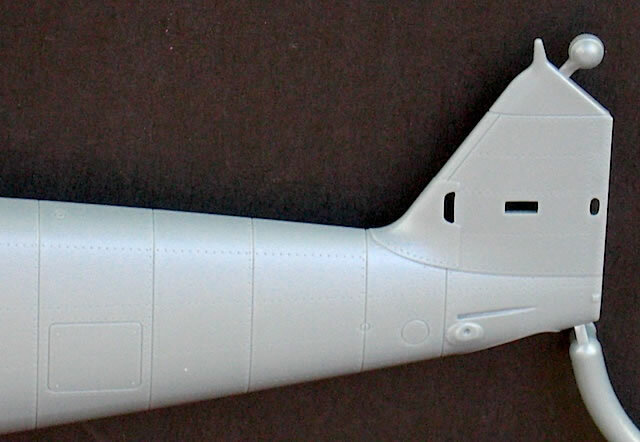 The decal sheet has been produced by Eduard and contains national and individual aircraft markings, but no stencils; these are available from Eduard separately on another decal sheet (http://www.eduard.com/store/index.php?cl=search&searchparam=bf+109+stencil). The decals that are provided look to be of good quality, although I noticed a tiny amount of black bleeding through on to the white of one Balkenkreuz. 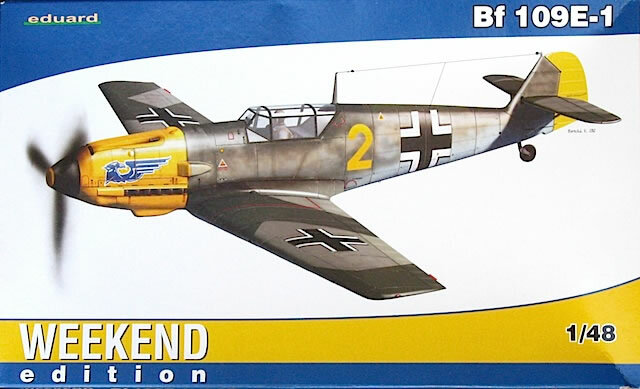 This is another fine Weekend Edition release from Eduard, and will be particularly attractive to modelers who want to spend less time building and more time painting their Bf 109 E models. Eduard’s 1/48 E-1 kit is detailed enough to look good without the need for additional photo-etched parts (although these are available separately if you want them), and the marking option that is provided with this release is both colourful and iconic. Highly recommended.